Officially six people have committed suicide by leaping or falling from Christopher Wren and Robert Hooke’s 202 foot memorial to the Great Fire of London, the Monument. 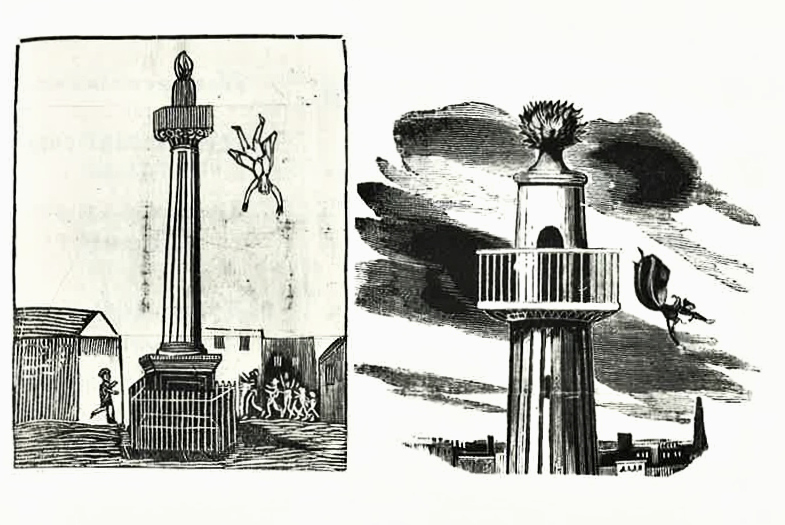 Walter Thornbury in ‘Old and New London’ lists six deaths but discounts one Thomas Craddock who he believes died accidentally toppling over the parapet trying to see a caged eagle. The Monument website says six, ignoring Thornbury’s first victim ‘William Green’ as the accidental death, and adding a baker known only as Leander. Whatever the correct number the tally is remarkably small for what was London’s highest suicides leap from its official opening in 1677 until 1843 when the viewing platform was enclosed in an iron cage to prevent any further acts of self destruction. It took 73 years of being open to the public for it to occur to anyone that throwing yourself from the top was a surefire method of doing away with yourself. According to contemporary newspaper reports one George Green, (not William Green as Thornbury and the Monument website call him) fell to his death in June 1750; the Ipswich Journal reports that “about Four o’clock in the Afternoon, a Man, wearing a white Waistcoat and a green Apron, went to the Top of the Monument, and attempting to walk round the Rail, fell from thence Into the Street and dashed his Brains out. There were found In his Pocket eighteen Guineas. He was carried to St. Magnus Church in order to he owned.” The Coroner’s Inquest brought in a verdict of accidental death after hearing that “the Way of his falling was this: In the Iron Gallery there is a live Eagle to be seen, for which it is customary to pay a penny but the person not being there to shew it. it being kept in a Wooden Cage, he, in projecting his body too far over the Rails, to look in at the back Pair of the Box, which is open to the Iron-work, lost his Hold, fell against the Top of the Pedestal, and from thence against one of the Posts in the Street, whereby the Top of his Skull was laid quite open, and the other Parts of his Body were very greatly shattered.” (Ipswich Journal 30 June 1750). Further reports raised doubts as to whether this really was an accident; “The Man who threw himself off the Monument was one Green, a Weaver, who had been delirious for some Time, under the Care of his Mother, who going out, desired a Neighbour to look after him, and she leaving him to himself, he took that opportunity and dressed himself and went out and Committed the above rash Action.” Thornbury has clearly attributed the mode of Green’s death to the second suicide Charles Craddock. Charles Craddock (not Thomas, as Thornbury calls him or John, as he is known to the authors of The Monument’s official website) was a baker who threw himself from the viewing platform in July 1788. 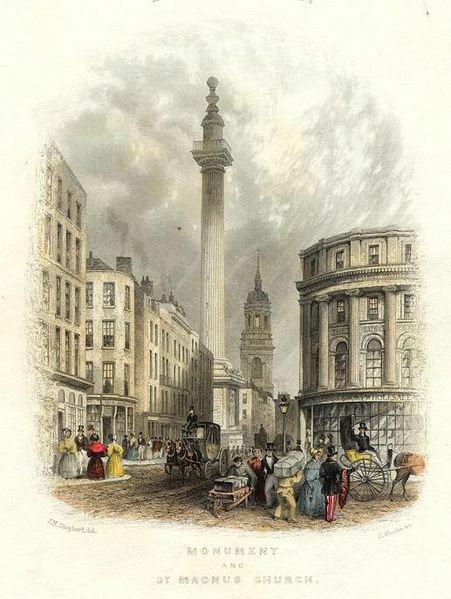 According to the Oxford Journal, reporting on the Inquest, “the poor Man had been melancholy for some Time preceding his perpetrating this rash action, and on Thursday last he went to see the Monument, and continued thereon near two Hours, and until he was fetched down by the Man who shews it. He afterwards told a Person he had put his Leg over the Rail, with intention to get over; and another Person he had told, that if a Person wanted to destroy himself, the Monument afforded a fine Opportunity. He was seen on the Outside of the Railing of the Gallery, and to look down with great Earnestness before he threw himself off. The Jury found their Verdict, Lunacy.” Intriguingly The New London Magazine apparently reported another suicide that same month "Yesterday morning, about eleven o'clock, an unfortunate man, dressed like a decent tradesman, and seemingly between fifty and sixty, rather tall, went up the steps of the Monument, and when there he put his legs over the rail of the gallery, and threw himself down. He fell within the iron palisades at the bottom; both his arms and both his legs were broken, and his head was crushed to pieces. His name is Elliott; he was an attendant in the new gaol, Borough; and jealousy was the cause of the fatal act." Two suicides in the same month should have caused a sensation; the absence of any sort of stir probably means that this was a case of mistaken identity, Charles Craddock being wrongly named as the jealous gaol keeper Eliot. Lyon Levy was a wealthy 50 year old Jewish diamond and pearl merchant who lived in Haydon Square in the Minories with his wife and eight children. 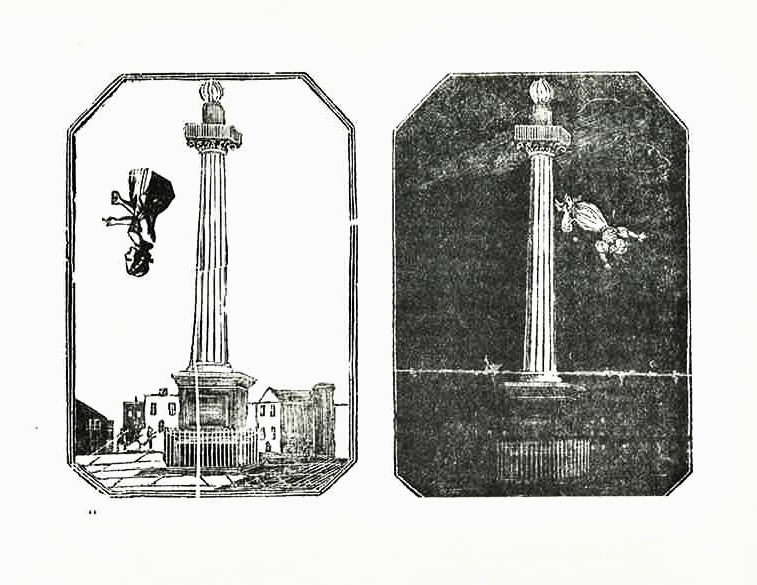 One cold January morning in 1810 Levy visited the Monument after stopping at the Bank a coffee house, and after walking several times round the outside of the iron railing, according to the Public Ledger and Daily Advertiser “sprung off and in falling, the body turned over and over before it reached the ground. When near the bottom, it came in contact with one of the griffins which ornament the lower part of the building. A porter, with a load on his back, narrowly escaped the body of the deceased, which fell a few paces from him in Monument-yard.” The Bury and Norwich Post gave a more graphic account of the jeweller’s death, he was, they said “dashed to pieces on the spot. His fall was broken by his pitching on some of the projecting figures, but he lighted at last on his head, in Monument-yard, and expired without a groan. A convulsive motion of the shoulders was all the appearance of life the body exhibited when approached immediately after the fall. His head was terribly shattered, and the brain protruded at different parts. The face was so much disfigured, that the unfortunate man was with difficulty recognized.” He left no note but was known to have got himself into financial difficulties as the result of a risky commercial speculation. It was also stated that his mother had been confined to a private lunatic asylum before her death and that he may therefore have been subject to hereditary insanity. The mysterious baker of Reading, Leander, also killed himself in 1810. These few bare facts are recorded in William D. Reider’s “The new tablet of memory; or Recorder of remarkable events, complied and alphabetically arranged from the earliest period to the present time” of 1841 but I cannot trace any newspaper account of this suicide. 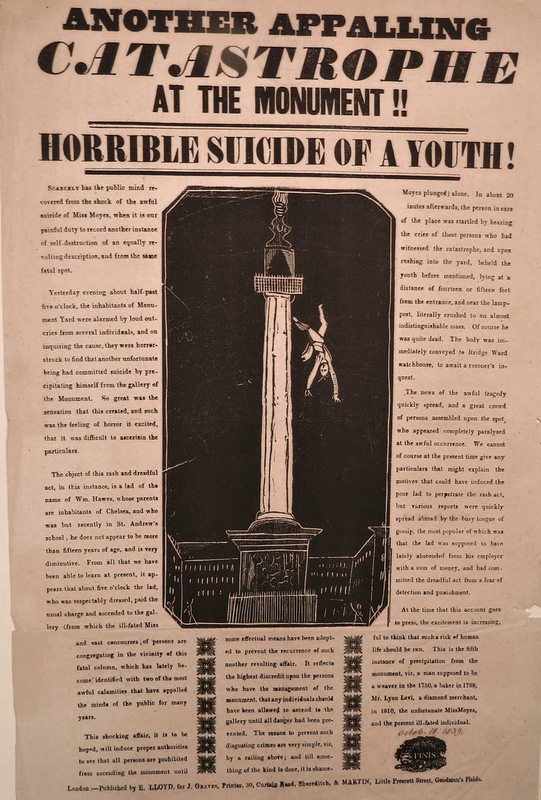 On 14 September 1839 The Spectator reported on what was to become the most celebrated Monument suicide; “The death of a young woman named Margaret Moyes, who was killed by leaping or letting herself fall from the top of the 310nument, excited a painful interest in the Metropolis on Wednesday. During the whole of that day, numerous incorrect reports or the occurrence and its causes were circulated. An immense number of persons, principally females, crowded round the Monument, (though the body was removed in the course of the morning,) to view the scene of this shocking act of self-destruction.” The journal went on to report the grim details of her death as reported at the inquest. Moyes paid six pence for admission at 10am, asking Thomas Jenkins, the door keeper, if two women and a man had already gone up as she was with them and they were supposed to be waiting for her. He told her that there no other visitors and she ascended the 311 steps to the viewing platform alone. A few minutes later he “heard a body falling. He went to the door, and found the deceased lying with her legs across the door-way, and her head pointing towards Fish Street Hill. Her left arm was several feet front the body, and a good deal of blood flowed, He found a rope, with a large knotted loop at one end, tied to the railings of the gallery: she must have concealed the rope about her person. Her bonnet and veil with a waistband and pair of gloves, were lying in the gallery, near the door.” What was the rope for? None of the newspaper accounts which mention it feel the necessity to explain so its use must have been obvious to contemporary readers but not to me. A post mortem was carried out by Mr Charles Croft, surgeon of Fish Street Hill, who told the inquest “I have examined the body. The left arm is cut off; and there is a fracture of the skull, and of the spine, and left thigh. The fracture of the skull was a compound one, sufficient to cause death; but I think the immediate cause of death was fracture of the spine. I did not examine the body internally, but I did externally; and from that examination I am of opinion that she could not have been pregnant. I think she must have been dead before she reached the ground, on account of so little blood having flowed from the body." The untimely death of 21 year old Margaret Moyes excited much public sympathy, because she was a respectable young woman, because she was by all accounts attractive and because of the pathos of her home life. Her mother was dead and her father, a baker, was bed ridden, seriously ill and expected to die at any time. Margaret had been nursing him in his final illness at the family home in Hemlock Row, St Martin-in-the-fields and was, unsurprisingly gloomy about the future faced by herself and her five siblings once he was dead. Before taking her final walk to the Monument Margaret had written a last message to her family in a memorandum book which she left on the mantelpiece where it was sure to be found – “You need not expect to see me back again, for I have made up my mind to make away with—Margaret Moyes." A 15 year old boy, Robert Donaldson Hawes, who was the son of a Chelsea coachman, had studied at St Anne’s school in Brixton and was about to be sacked from his job as a household servant for a surgeon, took a particular and apparently morbid interest in Moyes’ suicide. He frequently spoke about it to the other servants and also openly fantasied about killing himself by jumping from a height and threatened to throw himself out of the surgeon’s windows. Barely a month after Moyes suicide Hawes was dismissed from his job for ‘lethargy’ and the next morning, 18 October 1839, the committed a copy cat suicide. At the inquest Thomas Jenkins the Monument doorkeeper was back in court to describe the last moments of the second suicide. He told the Coroner “on the afternoon of Friday last, about ten minutes after five o'clock, the deceased came in at the Monument at the same time as a respectably-dressed man and woman, whom he accompanied to the top. A few minutes afterwards two young females, apparently from the country, came in and went up, and almost directly after them two other females, who also went up. The two latter soon came down, and when the man and woman did so asked them how many persons were still up stairs, wishing to ascertain, it being near locking-up time. They answered there were only two females and a young lad. About ten minutes afterwards I heard a noise as of something falling, and on going out I saw it was the deceased, who had fallen from the top. At that moment the two females came down, and without asking said, "We have left only a lad up stairs;" to which 1 replied, Poor fellow, he is already down." Following the death of Jane Cooper the authorities took belated action and closed the Monument while an iron cage was constructed around the viewing platform. This has been replaced several times, mostly recently in 2008, and there have no further deaths at the famous landmark.